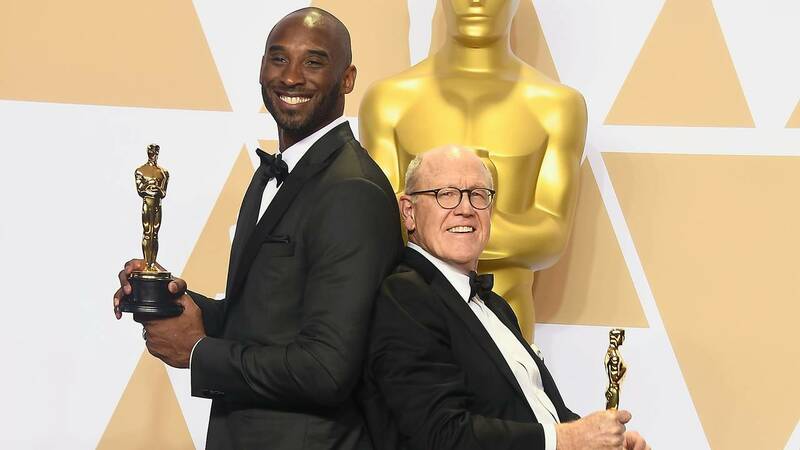 Kobe Bryant and Glen Keane pose for pictures after winning an Oscar for "Dear Basketball." Kobe Bryant can now add another trophy to his collection, but this one is an Oscar in the animated short film category. On Sunday night, the retired Los Angeles Lakers superstar received the award at the Academy Awards for his contributions to the animated short, "Dear Basketball." "Dear Basketball" is based on a poem he wrote in 2015 announcing his basketball retirement, ESPN reported. Bryant shared the Oscar with Disney animator Glen Keane. Byrant said in his acceptance speech, "I don't know if it's possible. I mean, as basketball players we're really supposed to shut up and dribble, but I'm glad we do a little more than that." "And to Kobe, for writing 'Dear Basketball,' it's a message for all of us," Keane said. "Whatever form your dream may take, it's through passion and perseverance that the impossible is possible." The four-minute animated short can be viewed on go90.com.